Most commercial-scale community wind projects are multi-million dollar investment endeavors that require outside financing assistance. This section will give you some background on how to approach a bank or other financing entity. 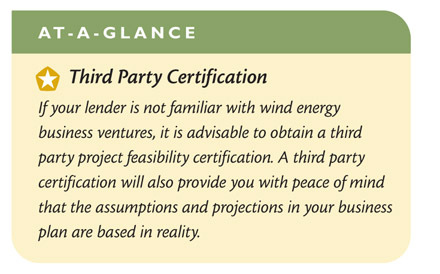 Loan terms will affect the bottom line of your wind energy project revenue, so understanding the requirements and options for financing your wind development are critical. Getting organized in the beginning will put your project in a much better negotiating position for acquiring favorable financing. With enough due diligence documentation, your project will be less risky and more attractive to a financing entity. Getting a Bank Loan: What will the bank want to know? 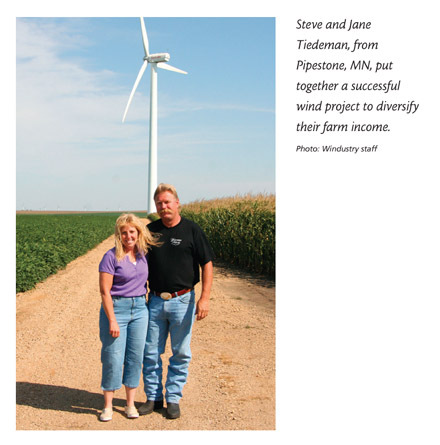 Community wind development offers substantial new economic opportunities for rural landowners and communities, with considerable environmental benefits. Although wind power can be lucrative, markets can also be competitive and the margins can be tight. The process for securing financing can be much more challenging for local communities than for a large wind development firm. As with any investment, wind energy projects require research and a fundamental understanding of the risks, costs, and benefits involved. A community wind developer needs to have a working knowledge of how this investment will translate throughout the entire project, from the initial resource assessment through operation and maintenance at year 20 and beyond. Windustry’s “Know Your Economics” fact sheet provides a good introduction to economic issues with commercial-scale wind development. 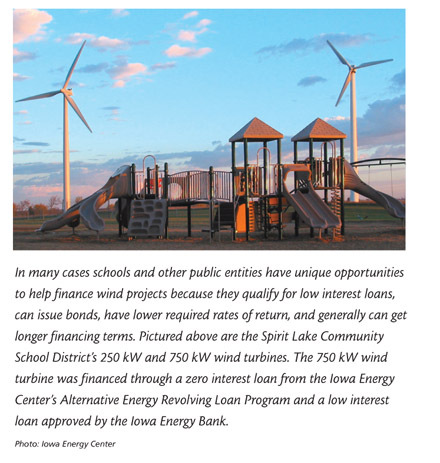 In many cases, developing a community wind project necessitates requesting a loan from a bank, much as building a new ethanol production facility does. Loan terms for the debt vary, but typically are 10-15 years for conventional bank loans and up to 20 years for bond financings. The equity investment in a project is the amount of capital that is not borrowed, but is invested directly into the project upfront. This may come from private savings or direct investment by members of a cooperative, partnership, or LLC that is interested in obtaining a desired rate of return from the project’s ongoing revenues. Getting a Bank Loan:What will the bank want to know? Some banks and financial institutions in the Midwest have experience with the wind industry and are comfortable financing wind projects. However, if wind energy is new to your area, local banks might be wary or have a lot questions about your plans. This section outlines the basic information you should have available before approaching a bank for a loan. A lender will want an overview of your project, including detailed cost estimates (written quotes for equipment, interconnection, installation, operation, etc.) and a legal description of the proposed project site, including aerial photos and plat drawings if possible. You also will need detailed budgets of project expenses and income (monthly for at least 24 months, and annually for 10-20 years). See the section above on "Wind Resource Assessment" as well as the "Costs" section for more detailed discussion. This sample pro forma shows some of the information your lender is likely to request in order to consider your loan. Many lenders require a minimum equity contribution of 30 percent of the project costs. The term note is typically amortized over 10 years with quarterly or yearly payments. The interest rate on the loan is important and can make the difference between a project that makes a profit and one that simply breaks even. It is important to know what rate of return is foregone by investing the money in the turbine project to determine changes in tax payments. A legal review of contracts, permits, and easements. The availability of proven expertise in wind project design. Individuals and groups who are interested in developing a wind project are strongly advised to seek expert financial advice as they evaluate potential sites and financial scenarios. Other means of obtaining debt financing such as bond financing are starting to be used in the wind industry as a low-cost and longer term financing alternative. Bond financing requires due diligence documentation similar to that required by conventional banks. Clean Renewable Energy Bonds have been available to entities that are not eligible for the production tax credit (PTC) due to their non-taxable status, including state and local governments, rural electric cooperatives, Native American tribal governments, and public and private non-profit organizations. After the bonds are issued, their interest is paid by the federal government in the form of tax credits, creating an interest-free source of financing. The IRS received over $2 billion in applications for the initial $800 million available. An additional $400 million in financing authority was issued in late 2006 with a deadline of July 13th 2007 for applications. Due to problems in Congress, the program has gone unfunded in recent years. CREBs and other tax incentives are discussed further in the "Tax Incentives" section of this Toolbox. Terms and numbers contained within the document are not to be construed as typical project costs with the rapid rate at which the wind industry is evolving. Different financing companies will have differing terms for lending to a wind energy project. To find out specific terms for various lending institutions, you should contact them directly.